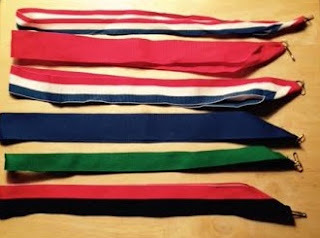 Sports Medal Recycling: Do You Need Clean Race Ribbons? We often get race medals to recycle that have clip-on ribbons that were never used. We were contacted by a charity race that creates hand-made, custom medals for their finishers. They asked us if we had any of these ribbons to send them for their event. 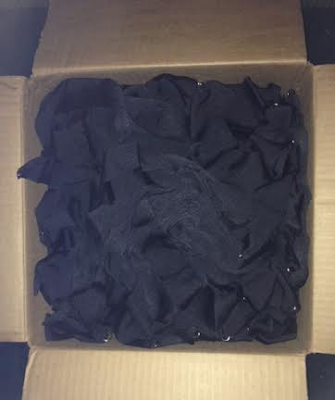 We sent them hundreds of clean ribbons, and they worked out great for their event! We will gladly send any charitable race event unused clean ribbons to create their own finisher's medals. The ribbons will all be from extra race medals, and will be plain ribbons (no logos or branding). They are available in a variety of colors. Think of other great purposes for these ribbons- can children at a youth center make special awards for family members? Do you have a race that benefits a nonprofit, special care facility or children's facility where the patients can make finisher's awards for the participants, and you just need the ribbons? These types of activities would be great fits for these unused, clean ribbons. Here's a picture of an assortment of unused clean ribbons we could pass on to you. Please contact us at sportsmedalreycling@gmail .com if you are interested. This was a box of 500 clean unused race ribbons that we sent to a charity event to make their own finisher's medals.